That was a surprising turn of events, and I now have a glimmer of hope that Scandal will be able to conclude with a little bit of dignity. 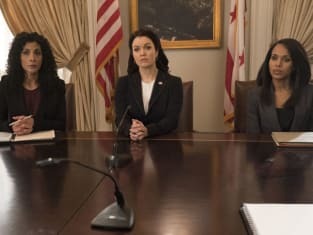 The truth about B613 came out on Scandal Season 7 Episode 17, and it was enough to send all of the key players over a cliff. While it was surprising to see Olivia plead with everyone that all they have is the truth, she's right. 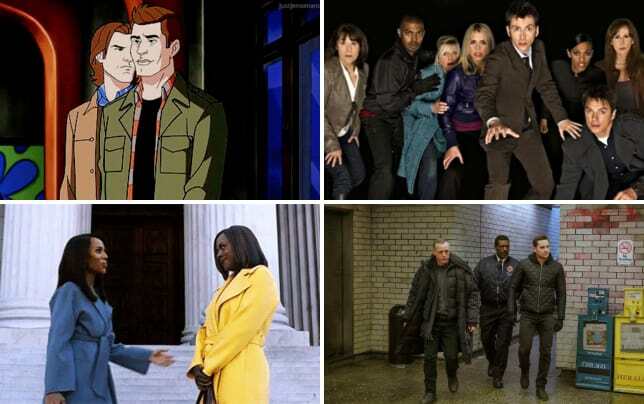 All of these characters have done despicable things over the years, and it would be difficult to see them all going off to the next chapter in their lives without so much as a slap on the wrist. I wanted to smack Jake when he gave the footage of Mellie and Olivia chatting about the Bashran order. That was the moment that proved this fight to the death is going to be tough. But there was really no other way for the key players to get ahead of Jake and Cyrus without revealing all about the past. Sally Langston showing back up for this final adventure was fitting when you consider the way she's controlled the narrative for so long. If you watch Scandal online, you will already know that she's also done her fair share of wicked things, but she wants America to think for itself now. It's scary to think of the ramifications of the world learning that an underground operation has been controlling the White House for the last 30 or so years. There's going to be a lot of frustration because, in essence, they've been voting for a face to lead the country as opposed to brains. Why vote someone into the office if it's giving them very little power? It's all a little nonsensical, and there's no way people won't go after those responsible. 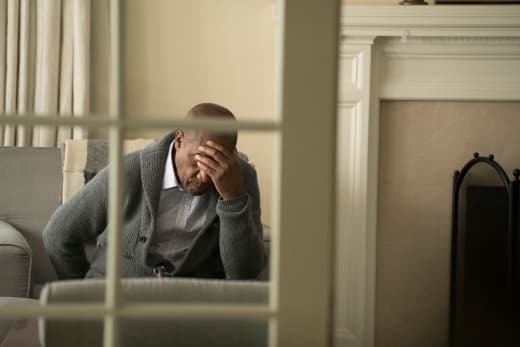 Jake has proven time and time again that he will go where the power does, but what does he do to get help when he feels his grip on the world starting to loosen? He turns to his father. Yes, I laughed out loud several times during that conversation with Rowan. I can't be the only one who rolls my eyes when Rowan goes off on his little rants, but he was awesome throughout "Standing in the Sun." His assessment that nobody is really in power if they're shouting it from the rooftops was great because it was his way of saying that Jake and Olivia never really lived up to their full potential and that's why they're in such a crappy situation right now. Despite Rowan being harsh, Jake obviously still feels some sort of attachment to him or else he would have pulled the trigger. There's always been something messed up about Jake, but I don't think he would ever pull the trigger on Rowan or Olivia. It's easy enough to throw threats around, and we know Jake is as ruthless as they come, but it's difficult to imagine him killing either member of the Pope family. You’re all sharks — you, Fitz, Cyrus and Olivia. I’ve heard things over the years. Election rigging, blackmail, murder. … Now you’re horrified and surprised that one of your sharks attacked you, behaved like a shark. Wouldn't it be fun to get an episode focusing on what would have happened if Jake and Olivia stayed on the island? Jake has been vocal about only being happy there to the point he has a little vial filled with sand from the beach. Could he really live a life that does not involve killing individuals? Either way, the truth about Vanessa's death is going to come out now because everyone is going to be put under oath and asked questions now. 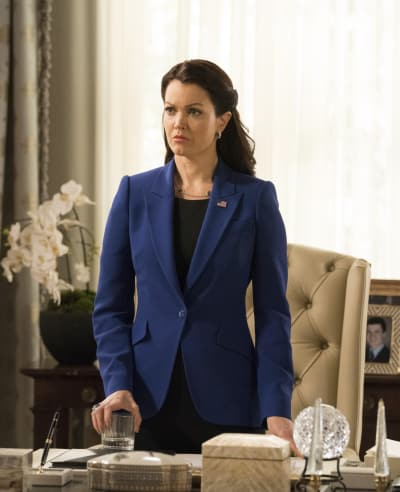 It boggled my mind why Mellie was so shocked about everything that was happening. I'm glad Marcus was there to talk some sense into her. His analogy about sharks biting back was a decent one. The most significant development for me was that Mellie was all too happy to join forces with Olivia again. Yes, she needs to help Charlie, but it was months ago Olivia was okay with having her killed. Even if everyone makes it out of this final fight, I can't imagine them all working together again. They're all going to want to disappear and live what's left of their lives away from the media. No. I did. I gave the order. By the authority vested in me… as Command of B613. Permalink: No. I did. I gave the order. By the authority vested in me… as Command of B613. If all else fails, they could just put everyone under house arrest at the White House because that would make for a fun spin-off. 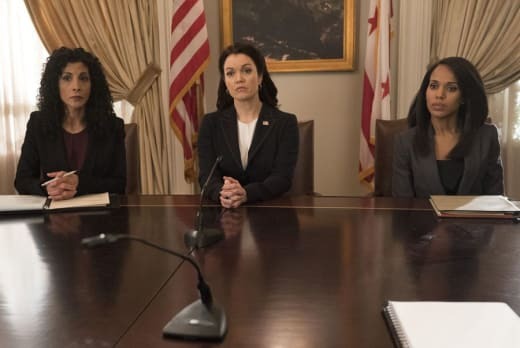 Related: Scandal Season 7 Episode 1 Review: Watch Me! They would be bickering every single night. It would have more fights than an episode of Jersey Shore, which we can totally reference again. Okay, Scandal Fanatics. It's over to you. Who do you think will be sent down, and why? Who deserves a happy ending at this stage? 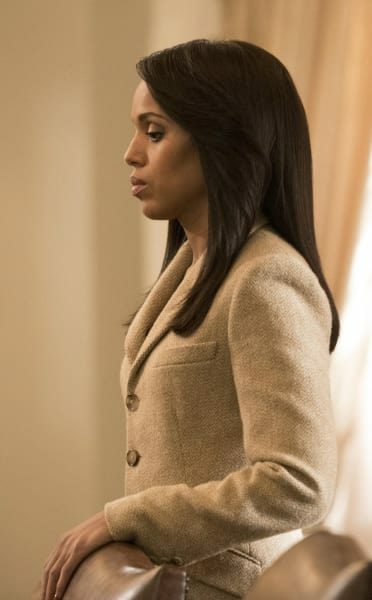 Scandal concludes Thursday, April 19 on ABC!